One of those meals that prove difficult to pronounce at first for many, with an Italian twist to it, a little like my sir name had to do that. Of course if its pronunciation is complicated, so does your perception on how it’s prepared, or at least that’s what we thought. The moment I hear someone has prepared some lasagne, I would internally wave my hands up and down for them. So every time we pass by the pasta aisle in Nakumatt, Dion and I would take a moment to look at the lasagne sheets and make a mental note on how we’re going to try it out one of these days. You speak over the things you want to do, even when you know you’re not able to do it immediately. Challenge yourself, it becomes a short term goal and the next thing you know, you’re somehow working towards it – even when you think you’re not, it eats up your mind until you do it. I digress. So on our leave week, we said this is it. It really did feel like a mini-project, considering we really didn’t want it to backfire because we were in dire desire of a delish meal #IJustRhymed. Onto the net we went. Just so you know, Dion’s usually the Chef (he figures the whole meal out – from the ingredients, the complexities, the steps), while I play the Sous Chef (the one that does all the manual labor – the mixing, the whisking, the measuring, the cleaning – works a lot on making you submissive because you have to follow instructions to the dot). We did a little consulting here and there, for extra tips, besides what the net was giving us – others have been on the same road, and we didn’t want to repeat the same mistakes – it really helped. Salt, ground black pepper, bay leaves, nutmeg – you can throw in your spice. Heat the oil in a large frying pan over medium heat. Add the onion and garlic and cook, stirring, for 5 minutes or until onion softens. Add the mince and cook, stirring with a wooden spoon to break up any lumps, for 5 minutes or until mince changes color. Add the tomato and tomato paste, and bring to the boil. Reduce heat to low. Simmer, uncovered, stirring occasionally, for 30 minutes or until sauce thickens slightly. Remove from heat. Taste and season with salt and pepper. In a different medium sauce pan, combine the milk, onion, parsley stalks and bring to a simmer over medium heat. Remove from heat and set aside for 15 minutes to infuse. Strain the milk mixture through a fine sieve into a large jug and discard the solids. In another different large saucepan, melt the butter over medium-high heat until foaming. Add the flour and cook, stirring, for 1-2 minutes or until mixture bubbles and begins to come away from the side of the pan. Remove from heat. 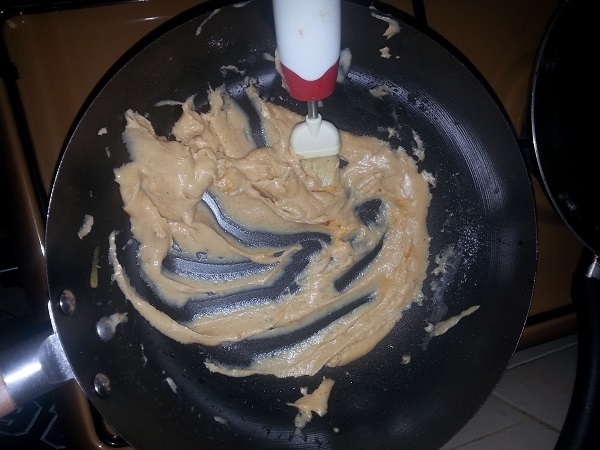 Gradually pour in half the milk, whisking constantly with the wooden spoon (or balloon whisk), until mixture is smooth. Gradually add the remaining milk, whisking until smooth and combined. Place saucepan over medium-high heat and bring to the boil, stirring constantly with a wooden spoon, for 5 minutes or until sauce thickens and coats the back of the spoon. Remove from heat. Add the grated cheddar cheese and stir until cheese melts. Taste and season with nutmeg, salt and white pepper. Put some warm water into a saucepan over medium heat, and place the lasagne in it. Boil it for 2-4 mins. Drain the water and rinse in some cold water. Immediately separate the sheets (or they’ll stick together like glue). It makes them elastic and easier to place on the bowl. Brush a rectangular ovenproof dish with oil to lightly grease. Spread one-quarter of the béchamel sauce over the base of the prepared dish. Arrange the lasagne sheet over the sauce and make sure all edges are covered. Ours needed 4 sheets for the bottom. Top with one-third of the mince mixture and one-third of the remaining béchamel sauce. 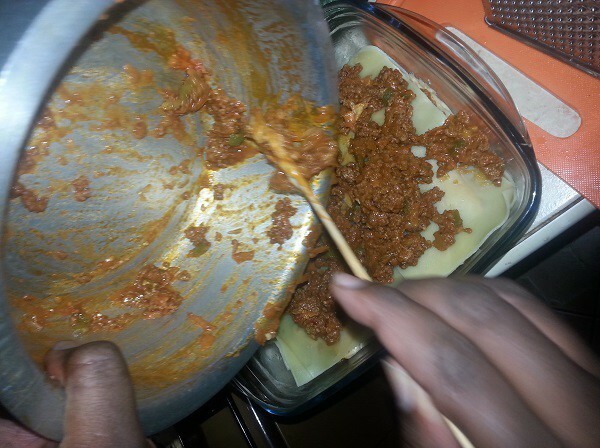 Continue layering with the remaining lasagne sheets, mince mixture and béchamel sauce. Finishing with a layer of béchamel sauce . Sprinkle with mozzarella. Place on a baking tray. 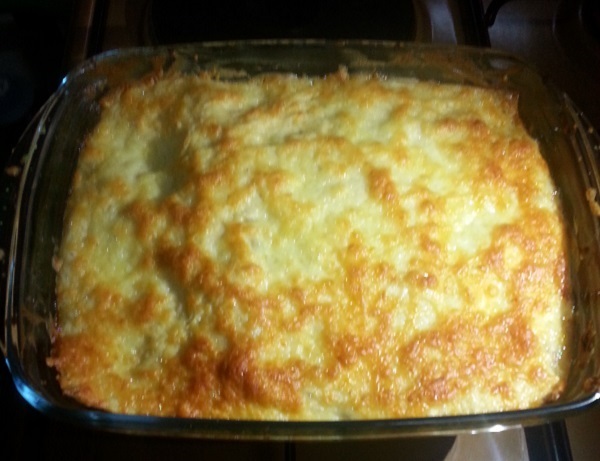 Bake in preheated oven for 40 minutes or until cheese melts, is golden brown, and the edges are bubbling. Remove from oven and set aside for 10 minutes to set. Finishing with a layer of béchamel sauce. Then we sprinkled some mozzarella cheese on it. 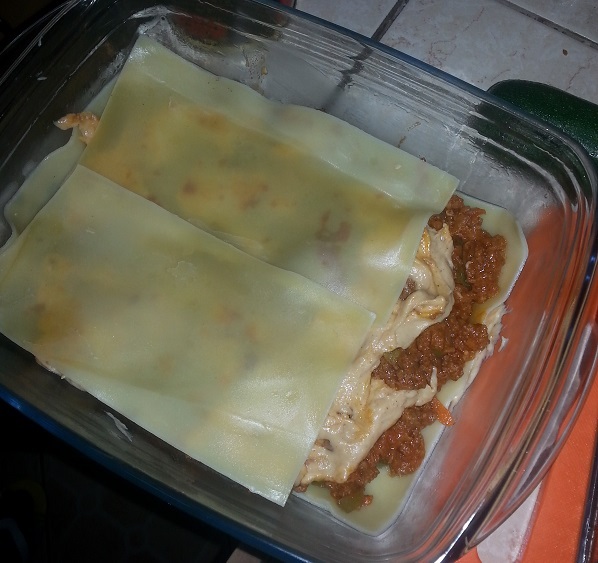 Cut the lasagne into portions and serve with some veggies. You could devour it on its own, because it’s totally delish, but the green on your plate helps you feel a tad healthy. If you know what I mean. You can then down it with a glass of chilled juice (or Ribena).